This delightful scene of carefree play between dolphins and the little boys, transports the viewer to an ideal paradise of innocence and beauty. 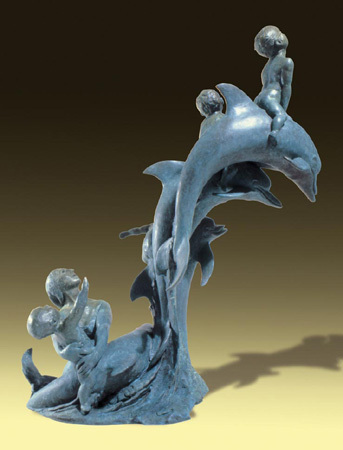 The graceful arches of the dolphins, the expressions of joy and delight on the faces children and mother alike, draw us into their happy mood. From ancient pottery and mosaics to modern television, mankind has enjoyed reminding us of our kinship with our aquatic cousins, the dolphins.